The developers, DNS Capital, LCC and KB Homes, said last Tuesday that they heard the council’s message loud and clear and returned Tuesday night with a slightly revamped proposal that includes the same total number of units, but with a total of six affordable units. The development also includes 1,020 square feet of retail. The council, despite some reservations, approved the revised plan on Tuesday night. Councilmember Al Mendall, though, voiced skepticism despite voting for the project. “I worry this is one of those votes when I look back and say, ‘Boy, I shouldn’t have done that,'” he said. In addition, over the past six months or more, Hayward renters have become clearly restive as issues over displacement and rising rents begin to claw toward the city. The mood, in part, led a majority of the council last month to warn housing developers that projects without affordable housing included will not be approved. An executive for KB Homes, however, appeared comically oblivious to the tenor at both the City Council chambers and the citizenry at-large. 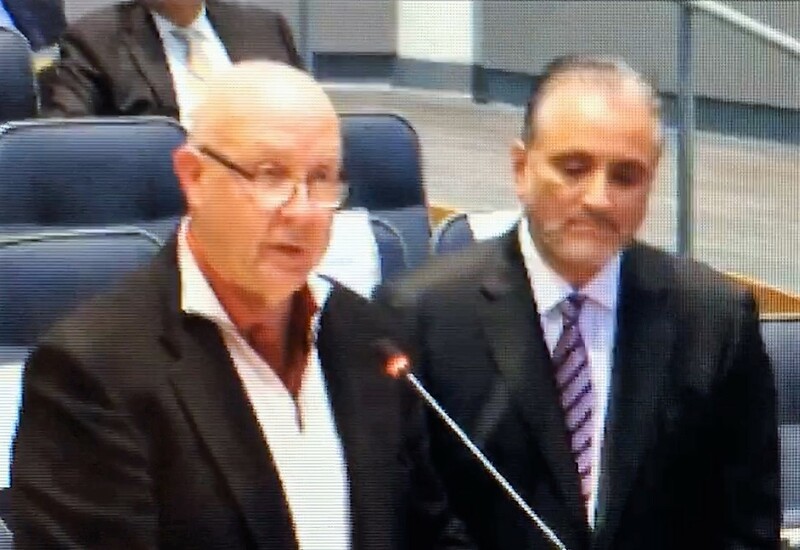 Ray Panek, a senior vice president for KB Homes, addressed the council Tuesday night wearing what almost looked like a red cravat while apologizing for being absent from the Oct. 3 council meeting. Posted in affordable housing, Al Mendall, Hayward, housing, Italy, KB Homes, Mark Salinas, Mission Boulevard, South Hayward. Bookmark the permalink. I wonder what kind of kickback the developers are giving to Hayward city council. Al Mendall is a buffoon and everything he votes to approve is questionable. I am all in favor of having the Bay area's highest ranking politicians, and also their friends and associates, and including any builders and developers they roll over for in exchange for large election campaign contributions and/or under the table bribes, take extremely long vacations. In fact, we should enact a special tax so as to buy them one way tickets to any far away destination they so desire, in other words Italy or anywhere else, and on sole condition that they never come back.